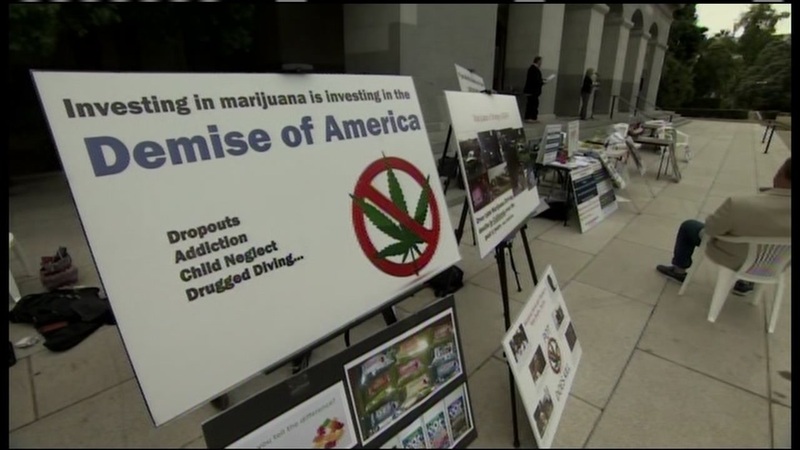 SACRAMENTO, Calif. (KGO) -- Proposition 64, the ballot initiative to legalize the use of recreational marijuana, got some blowback from a group of moms in Sacramento. The group known as Moms Strong says marijuana is the reason so many of their children suffer from mental health issues. They point out the level of THC, the active ingredient in pot, is infinitely more powerful than it was decades ago. "This drug causes a suite of psychiatric harms to those that are vulnerable. And the big problem here is: who is vulnerable? Who is playing Russian roulette with marijuana, the marijuana of today with potency as high as 300 to 800 percent higher than back in yesteryear?" said one of its supports. But supporters argue legalizing pot will limit and standardize its strength, so people will know what they're buying, since they'd be able to purchase it legally from a store, rather than from a dealer on the street.